Squash House Quilts: The Incredible Shrinking Block! The holiday’s are over and I’m back to work after nearly two weeks off. And what did we wake up to this morning - more snow! It started falling late yesterday afternoon and accumulated several inches, but by this morning it’s beginning to melt and warmer weather is expected. I desperately wanted to spend some time at the Squash House over break, but the weather and the roads just didn’t cooperate. Hopefully we can get over there later this month for a few days and get the kitchen appliances purchased and the old ones donated to Habitat for Humanity! So the age old question about quilt fabric is whether to pre-wash or not. My opinion falls in the “not” category. If I wanted to enter any of my quilts in competition, I would definitely pre-wash my fabrics - no question about it, but working full-time and wanting instant gratification just doesn’t afford me the time for that. I also know that it’s better to use a dry iron when pressing seams on quilt blocks. Sometimes I do and most of the time I don’t! One of my childhood jobs was ironing for the neighbors. They liked their clothes very crisp and wrinkle-free and if upon inspection something wasn’t just right, I had to re-iron it! So steam was my friend in those days and remains my friend. Ironing without steam for me is like walking out in a blizzard without a coat! And mind you, I don’t “iron” my block, rather I lightly “press” them as I learned long ago from a Fons and Porter episode. I’ve had pretty good luck so far with the blocks in my Winter Wonderland quilt. But this block was a bugger and I think I know why. It may look okay now (well, there are a couple of points that aren’t very crisp), but I really had to work to get it just right. 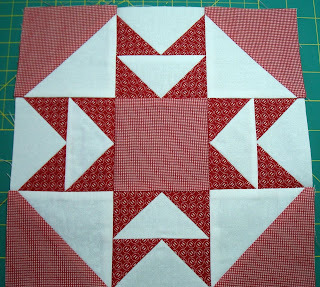 It seems that the darker red fabric must have been a looser weave than all of the other red fabrics I’ve used in this quilt so far. My cutting was accurate, but after making the flying geese and then pressing them, the red fabric shrunk a good 1/8th inch! It took me a while to figure out that it was the steam from the iron that was the culprit! I didn’t want to re-cut the block, so I adjusted my seams to make it all fit. Lesson for me for the day: compare the weave of your fabrics before using steam in your iron! By the way, don't forget to leave a comment in the Whirl Into Winter giveaway on this post! You need not have a blog to enter, but I must have a way to contact you if you win. That is very interesting. Most of the time I don't use steam but I can see how it can affect a block. No washing for me...never have and never will. I love the crinkled look after a quilt is bound and washed at the end. Interesting post, I NEVER pre-wash, I like to when I am all done so if it shrinks it has the old fashion look. I use steam like crazy, but i will think about it a little more now. BTW the block looks great!! I am so glad you are blogging about this quilt. I have had the pattern for some time ( cause I just love it ) and just joined a BOM club to do it. I rec'd my first fabric shipment, and I am going to prewash this. . . just because of the reds and whites. . . although I don't usuallly prewash my fabrics. .
Congrats on your progress on this quilt, I hope I am as dilegent and successful ! I will have to keep checking up on your progress. I hope you have dropped by my blog and entered my Whirl into Winter giveaway, I'll come back and enter, I want to follow my "list" so I am sure I visit all the participating sites. oh, by the way, I plan on quilting white snowflakes on my Winter Wonderland quilt, you can see them on my giveaway tablerunner prize. I used to wash all my fabrics before quilting, but I found it delayed the fun for too long. I was dying to get into the cutting and sewing and waiting for the fabric was torture. No more! Your blocks look perfect to me. The red fabrics are gorgeous. I also love the quilt you have featured in your header. Who designed that? Love that block!!!! I'm in the no washing zone too. Never did!! Call me an old fogey, but I always pre-wash. You can still get the wrinkled look if you don't preshrink the batting. And red fabric can bleed if not pre-washed. Also steam can pucker bias seams. I've found both these out the hard way. I never pre-wash quilting fabric, and I use a lot of red in everything! I do always use a Shout brand color catcher in the first wash, and that works just fine. I never prewash anything either! I do steam all of my fabrics with a hot iron before cutting, and that takes care of the shrinking problem ahead of time.